Join a passionate, committed team in a dynamic health center serving vulnerable patients in the beautiful state of Maine. The Maine Mobile Health Program (MMHP) seeks a Financial Assistant to support its mission of improving the health status of Maine’s seasonal workers and their families by providing culturally appropriate care and services. The Financial Assistant reports directly to the Finance Director and works from the Augusta, Maine administrative office. This individual is responsible for maintaining accounts payable, processing payroll, assisting with benefits administration, assisting in the preparation of monthly financial reports and analyzing financial data. For the past 27 years, MMHP has provided health care access to migrant and seasonal farmworkers (MSFWs) across Maine. A 501(c) (3) nonprofit organization and federally qualified health center (FQHC). MMHP has an innovative approach to medical care that is low-barrier values cultural competency and embraces the human dignity of an invisible and vulnerable population. MMHP’s unique model brings medical, dental and behavioral health services to patients via mobile units where they live and work and by connecting clients to local partners. MMHP is recruiting for a year round, full-time position of Financial Assistant based in Augusta, Maine. This is a 34-40 hrs/wk FTE hourly position and includes generous benefits (equal up to 30% of base pay-Section 125 for health, dental and/or vision insurance coverage or taken as cash) in addition to paid time off, holidays, option of HSA/FSA and IRA. The office operates Monday-Thursday with the option to work from home on Fridays. 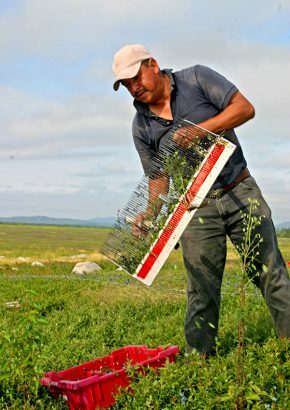 Individuals with the desire to serve migrant and seasonal farmworkers in the rural regions of Maine and with a strong work ethic and knowledge of accounting are encouraged to apply. MMHP is an equal opportunity employer. To apply, please send cover letter and resume to Carla Jupiter at ###pwhcvgre#at#znvarzbovyr.bet###. The Maine Mobile Health Program seeks an individual with bilingual skills in English and Spanish for a unique outreach position as a Community Health Worker (CHW) to facilitate access to care and services for Maine’s migrant and seasonal farmworkers (MSFWs) and their families. A CHW is a respected member of their community who acts as a bridge between medical providers and individuals to promote health, reduce health disparities, and improve access to care as well as to advocate for individual and community needs. 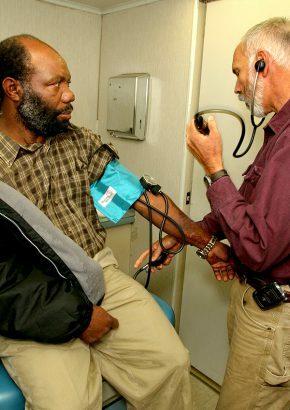 MMHP is Maine’s only farmworker health program and provides mobile clinics to farmworkers across the state to reduce their barriers to accessing medical care. The CHW will provide health outreach services to MSFWs across Maine. The position is based at MMHP’s central office in Augusta, Maine, but will require overnight travel DownEast at certain times of the year. Accommodations are provided for overnight travel. Ideal candidate will be a highly motivated individual with strong interpersonal skills, be able to empathize with patients and have a commitment to supporting seasonal farmworkers in Maine with their access to health care. This individual should have an understanding of the farmworker community either because of prior work, relationship in/to the community and/or other life experience such as shared language or culture. The candidate should be and be comfortable working in mobile settings and with a flexible schedule. This position will be part-time (20 hours per week) with a flexible schedule and including evening and weekend hours. Reliable transportation/clean driving record, basic computer skills and an ability to speak, read and write in Spanish at an advanced level are a must. To apply, please send a cover letter and resume to Jan Morrill at ###wzbeevyy#at#znvarzbovyr.bet###. the state to reduce their barriers to accessing medical care. with a focus on supporting the Haitian migrant workers in the Ellsworth region. record, basic computer skills and an ability to speak, read and write in Haitian Creole at an advanced level are a must. The Maine Mobile Health Program seeks an individual with bilingual skills in English and Haitian Creole for a unique outreach position during the 2019 blueberry harvest and wreath-making season. This Community Health Worker (CHW) position will facilitate access to care and services for Maine’s migrant and seasonal farmworkers (MSFWs) and their families. A CHW is a respected member of their community who acts as a bridge between medical providers and individuals to promote health, reduce health disparities, and improve access to care as well as to advocate for individual and community needs. MMHP is Maine’s only farmworker health program and provides mobile clinics to farmworkers across the state to reduce their barriers to accessing medical care. The CHW will provide health outreach services to MSFWs in DownEast Maine with a focus on supporting the Haitian migrant workers from Ellsworth to Cutler. The position is based at MMHP’s DownEast office in Milbridge, Maine. Ideal candidate will be a highly motivated individual with strong interpersonal skills, be able to empathize with patients and have a commitment to supporting seasonal farmworkers in Maine with their access to health care. This individual should have an understanding of the farmworker community either because of prior work, relationship in/to the community and/or other life experience such as shared language or culture. The candidate should be and be comfortable working in mobile settings and with a flexible schedule. This position will be full-time (30-40 hours per week), with an evening schedule and some weekend or daytime hours. Reliable transportation/clean driving record, basic computer skills and an ability to speak, read and write in Haitian Creole at an advanced level are a must. Join a passionate, committed team in a dynamic health center serving vulnerable patients in the beautiful state of Maine. The Maine Mobile Health Program (MMHP) seeks a Medical Director to support its mission of improving the health status of Maine’s seasonal workers and their families by providing culturally appropriate care and services. The Medical Director, a member of the Senior Management Team, is based part-time in the Augusta, Maine office and oversees quality primary care of Maine’s agricultural workers in an all-mobile health center setting. For the past 26 years, the MMHP has provided health care access to migrant and seasonal farmworkers (MSFWs) across Maine. A 501(c)(3) nonprofit organization and federally qualified health center (FQHC), MMHP has an innovative approach to medical care that is low-barrier, values cultural competency and embraces the human dignity of an invisible and vulnerable population. MMHP’s unique model brings medical, dental and behavioral health services to patients where they live and work via mobile medical units and by connecting clients to local partners. The Maine Mobile Health Program is recruiting for a year-round Medical Director (MD, DO, NP) based part-time in the Augusta office, with some provision of state-wide care. This individual will oversee MMHP’s medical providers (mid-levels, nurses, Clinical Coordinator, Behavioral Health Coordinator) and assist in the coordination and implementation of health care programs and outreach activities with agricultural workers and their families. Assisting in development of policies and procedures and leading the Quality Improvement (QI) Program in order to improve health care delivery are also required. This is a less than full-time hourly position and schedule is flexible depending on the candidate’s background and availability. MMHP offers a generous benefits package (a Section 125 plan equal to 20% of annual income, to be used for health, dental and/or vision coverage, or taken as cash) in addition to paid time off, paid holidays, an IRA and an optional FSA. The Maine Mobile Health Program is an equal opportunity employer. To apply, please send resume and cover letter to Lisa Tapert at ###ygncreg#at#znvarzbovyr.bet###.